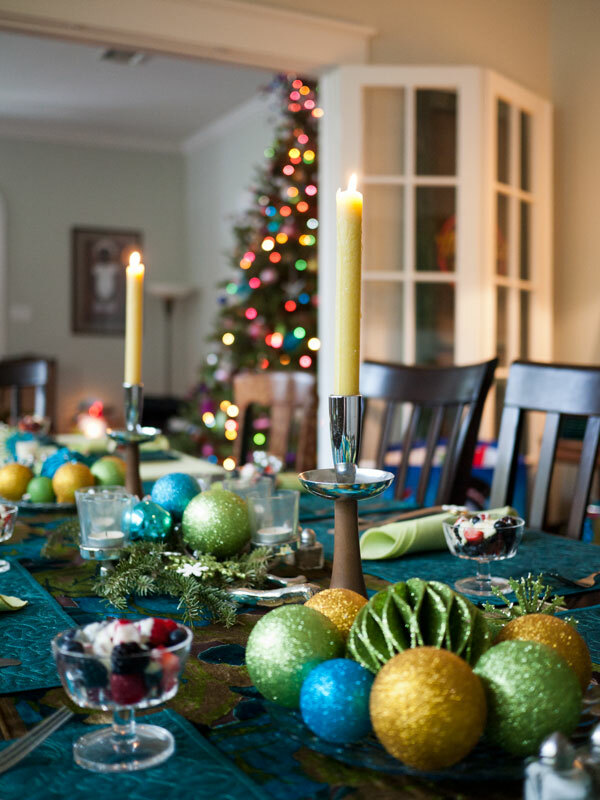 Christmas is the time when the entire family, and also the extended family comes together for the feast. So you need to make the table as enticing as the meal itself. There are plenty of Christmas table decoration ideas you can adopt like traditional red and gold, or something glitzy and glamorous. Rustic and country side themes are also gaining popularity. All you need to create a wow dining space is a little effort and imagination. 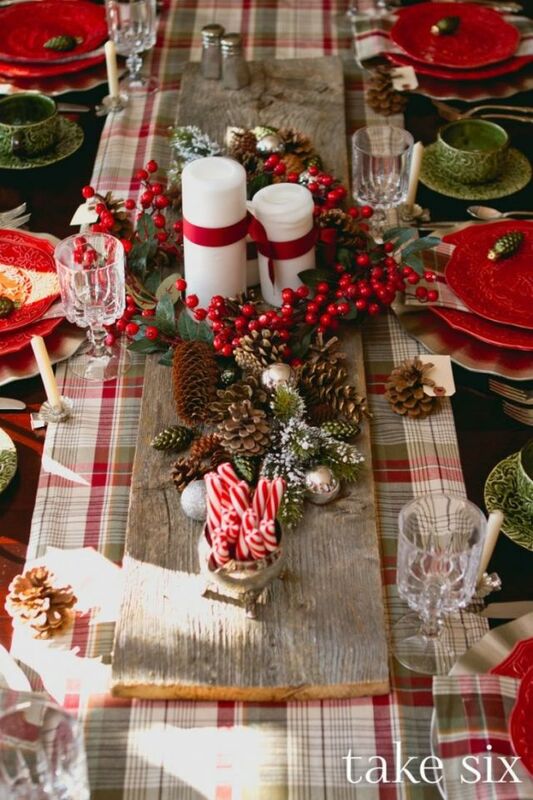 Below, you can check out our hand-picked collection of Christmas table decoration ideas for inspiration. Keep scrolling. 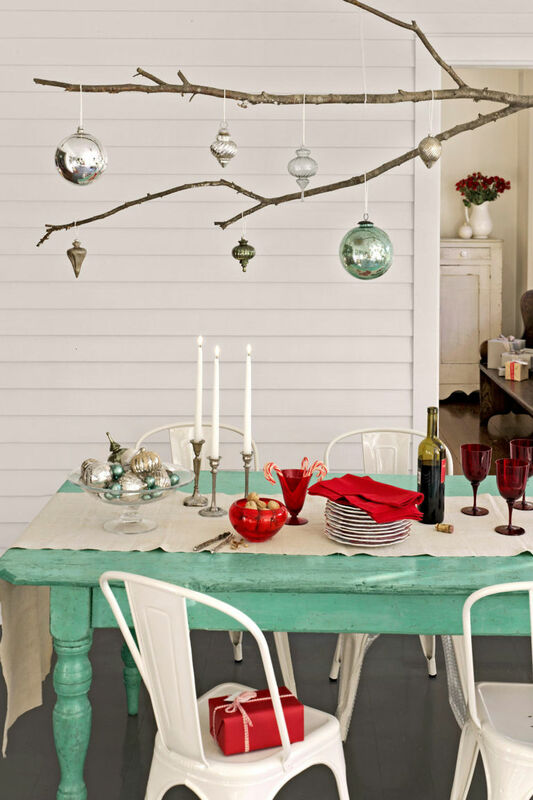 It’s the subtle touches that add festive charm to the decoration and table is no exception. 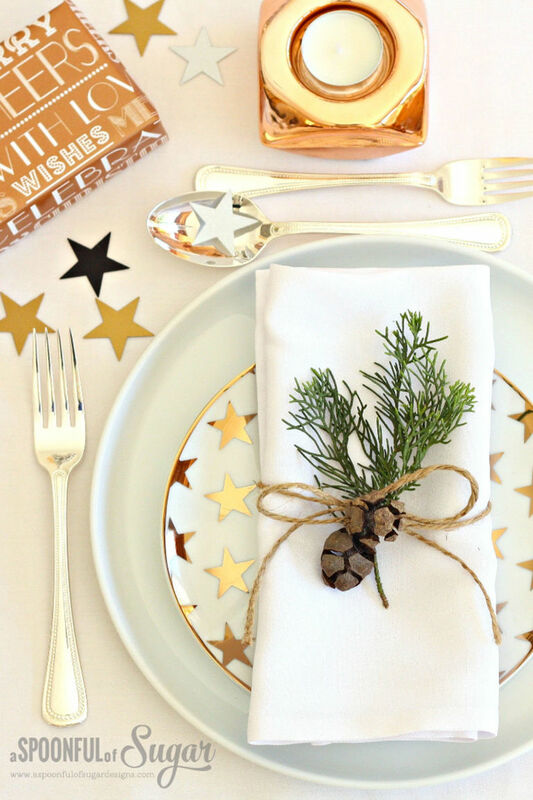 Cut out the stars using a craft punch and scatter on the table. 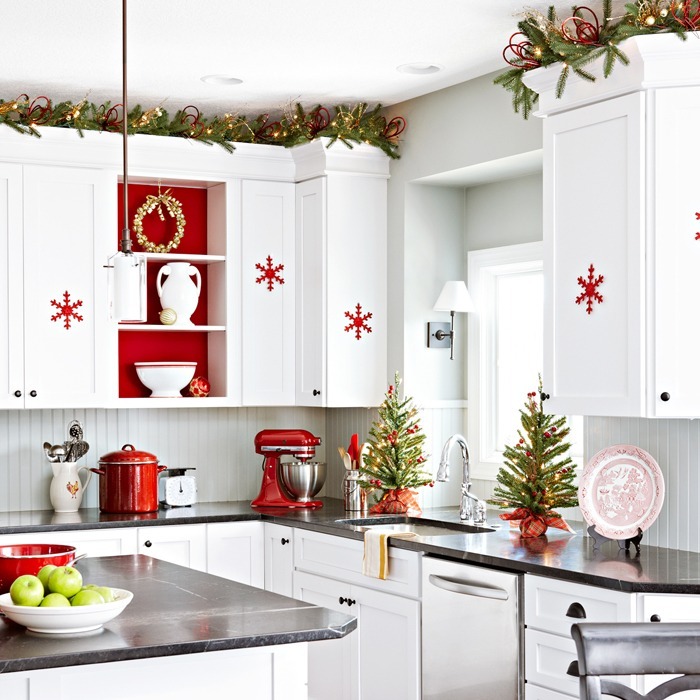 If you’re brave enough to see beyond red and green, opt for this refreshing color combination. 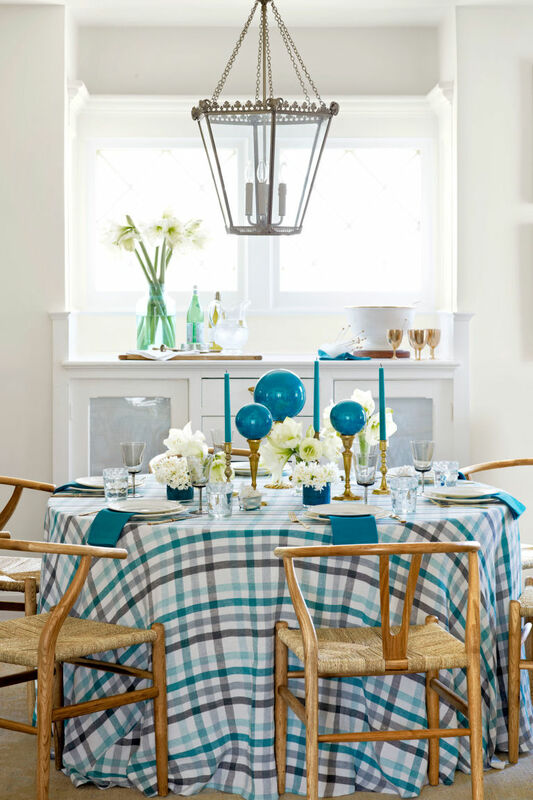 The white cotton balls, along with bold blue tablecloth is giving a modern vibe to it. Who said that you have to limit the tree ornaments only to the tree? You can arrange them on the table also to create a lovely table presentation. This has to be one of the most unique centerpiece ideas we’ve seen in a long time. 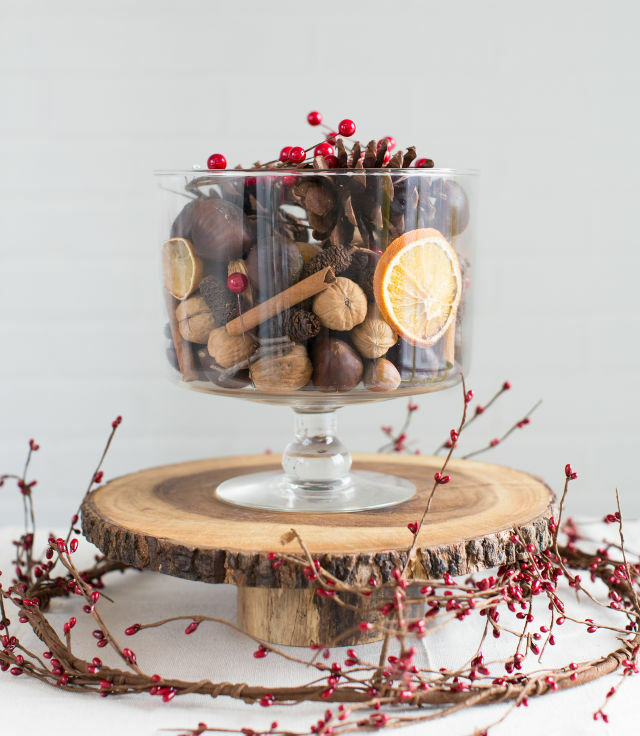 A glass container is filled with faux cranberries, pine cones, cinnamon stick, and dried fruits and put on display. When you’re deciding on table centerpiece, we’d suggest you not go overboard with it. 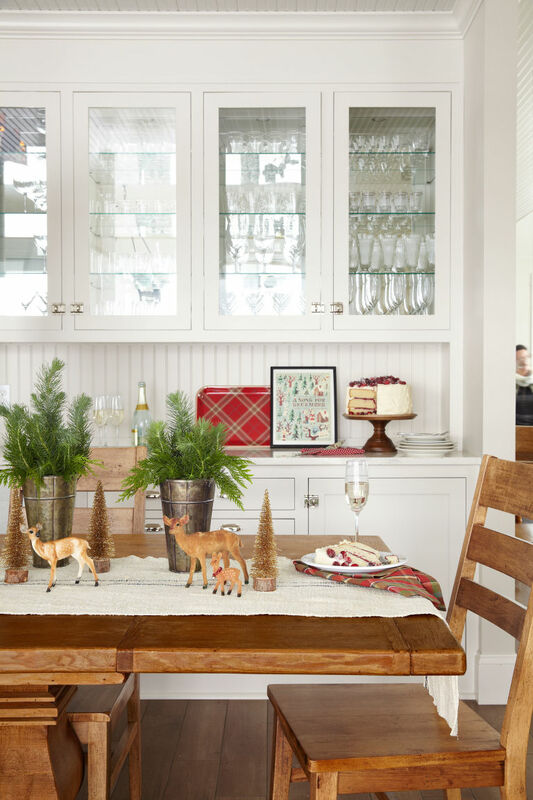 In this idea, bottle brush trees, toy deer and sprigs of greenery in sap buckets are used. 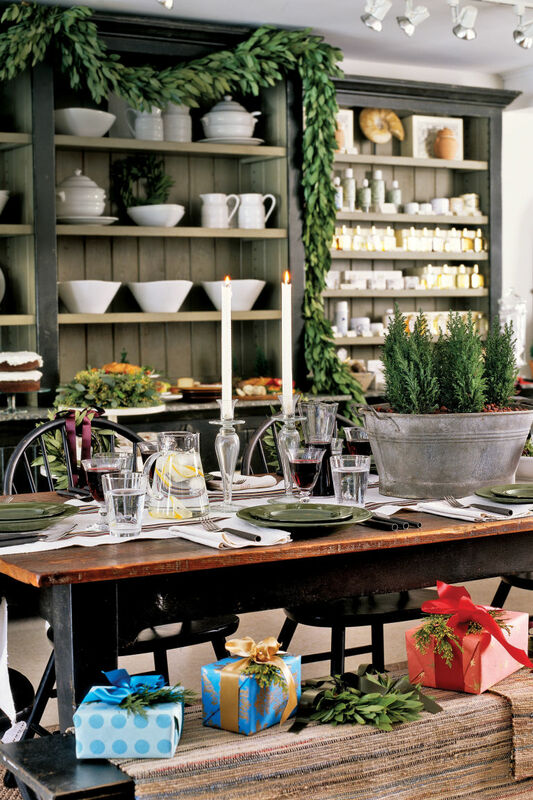 This long dinner table has miniature trees or rosehips in a galvanized tub as the centerpiece. The bright gift boxes are also a wonderful addition. 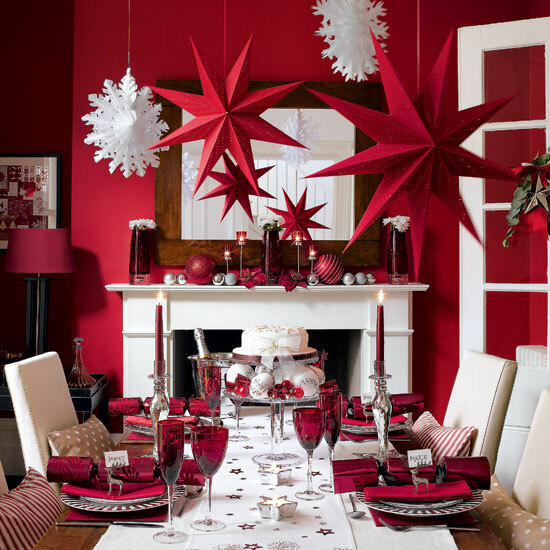 Paint the table red by following this festive table decoration idea. 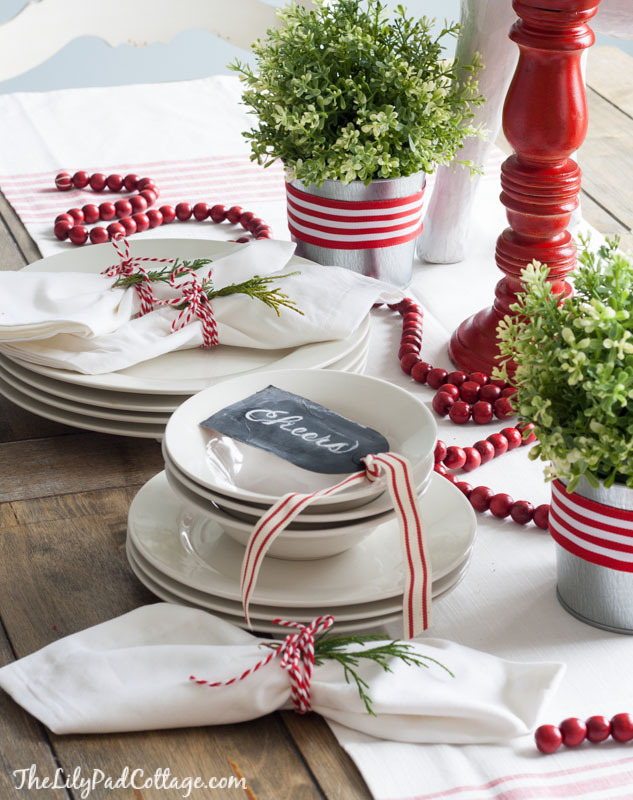 Plates, candles, table runner, ribbons, everything, is painted red here. 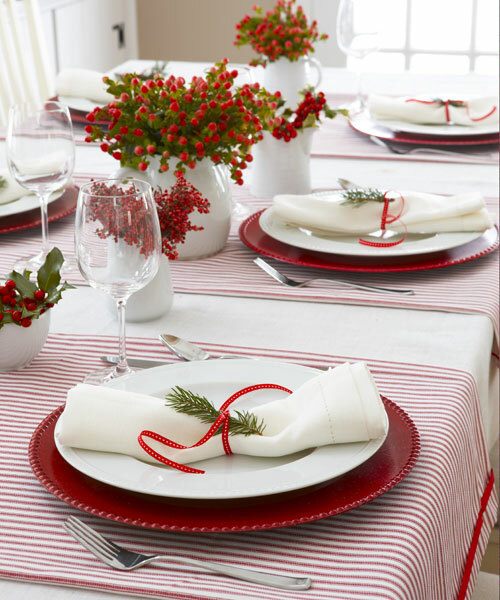 Select clean linens that go with the festive season. You can even try your hands at sewing with this idea. 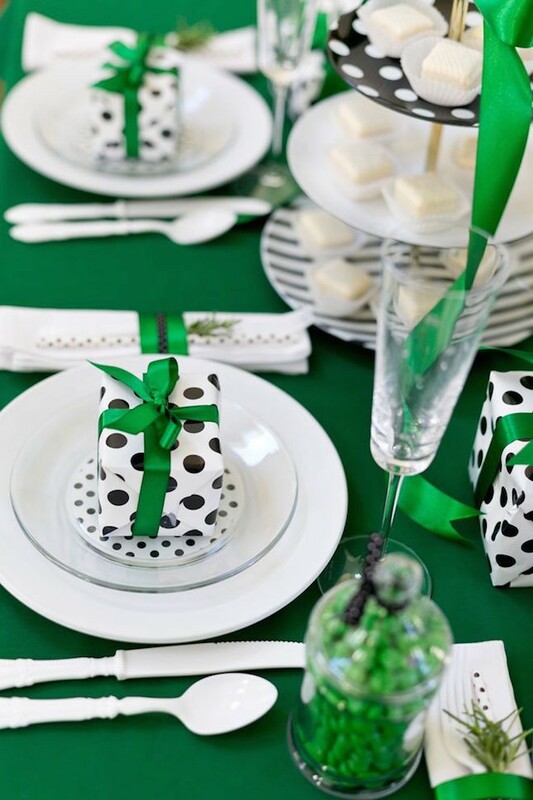 If the Christmas colors are getting too much for you to handle, try this green and white table decoration. 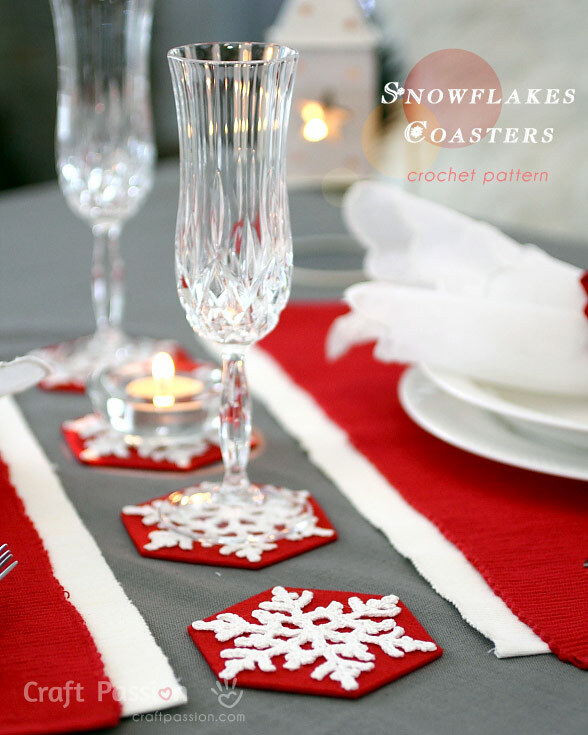 The snowflake coasters will add a merry addition to the Christmas table décor. And believe us, even the guests will adore it as much as we do. 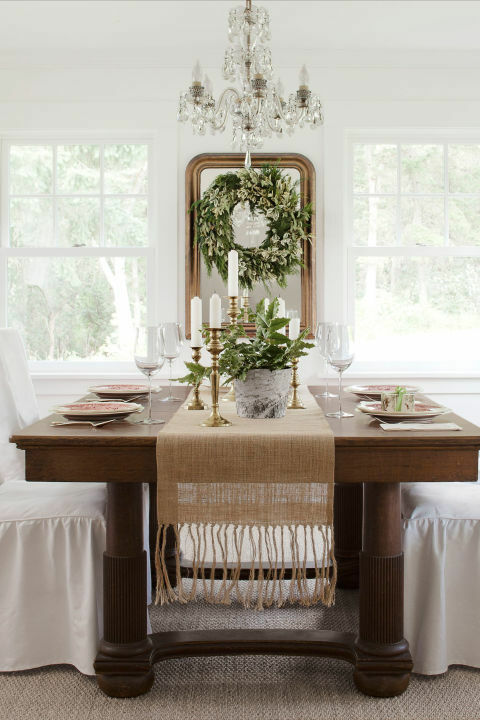 This is one of the simplest, yet most beautiful centerpiece ideas we’ve come across. 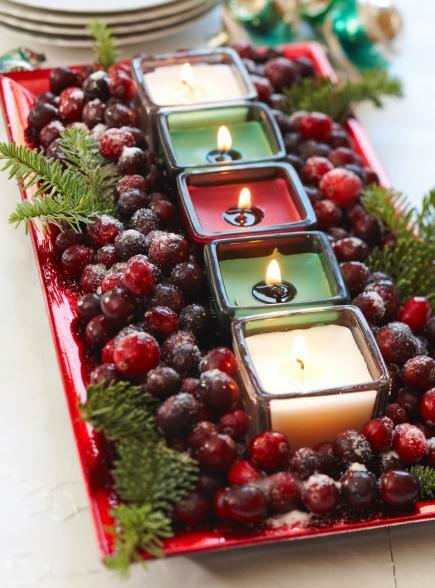 Place the votive candles in a red dish and fill it with cranberries. That’s all about it. This design is thoroughly modern. Instead of using red, green and yellow, the blogger has used black, white and yellow. The paper Christmas trees are adding a charm of their own. One thing is for sure. 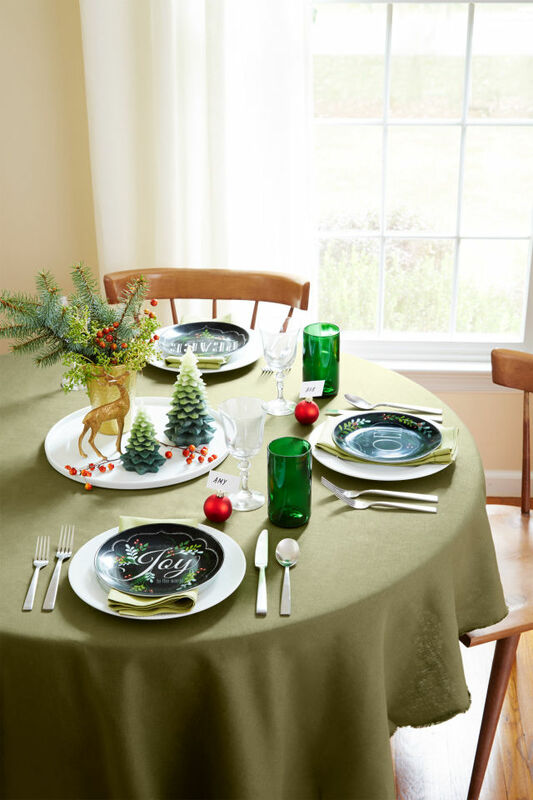 You won’t need to change the table setting for New Year with this one. It looks super festive and will go with other holidays too. Placemats do not always have to be of paper or plastic. You can use wooden discs as well. Since Christmas colors clash with most of the interiors, how about picking a completely non-conventional color palette this Christmas? You can use existing colors to enhance your décor. 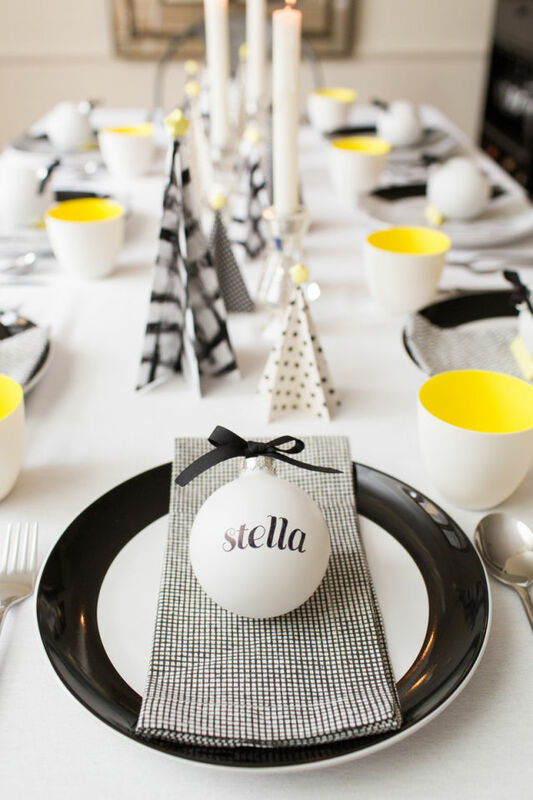 The white starburst is the highlight of this table decoration. But that wouldn’t have been possible without pinecones and pine leaves garland. Instead of filling the entire table with name cards, write a sweet, holiday note on a chalkboard and put it on display. The red beads are also an excellent addition. 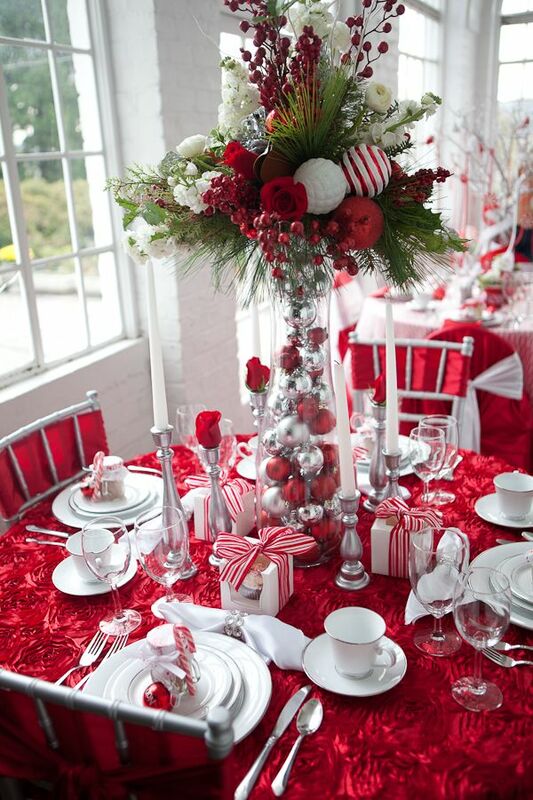 This idea is sure to make your Christmas table stand out from the crowd. 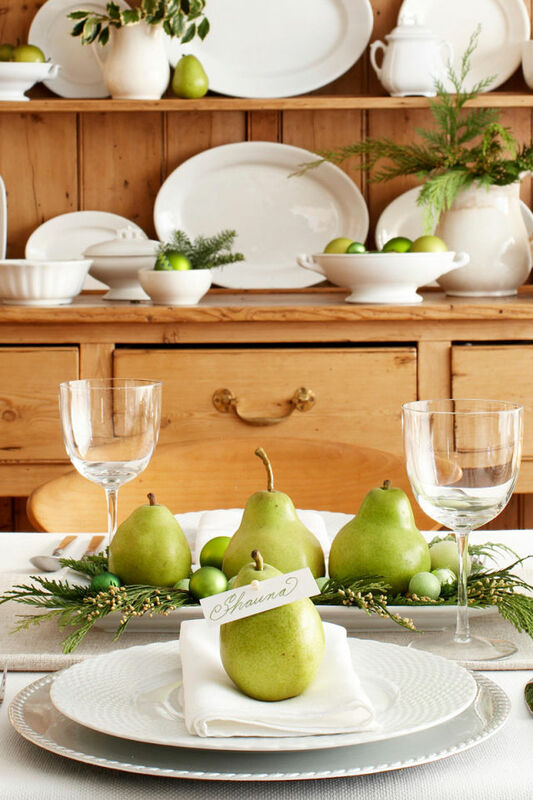 While most of the people use fruits like cranberries and orange for decoration, you take an unconventional route and opt for pears. 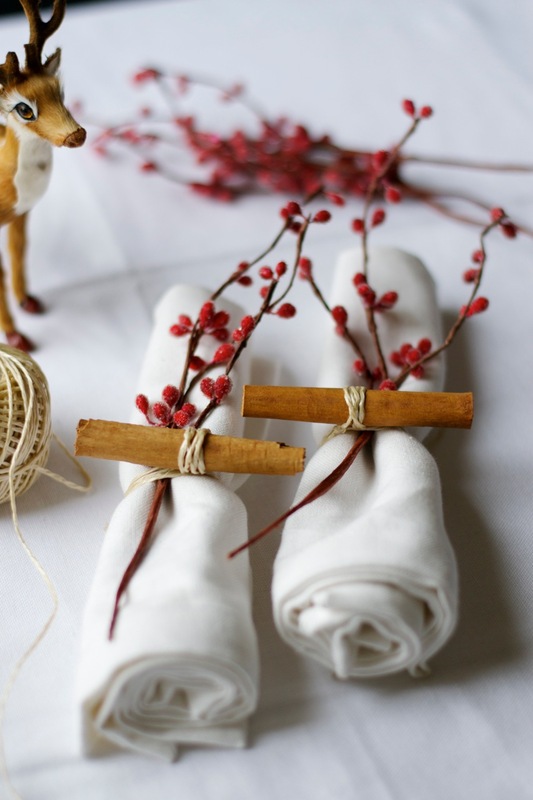 Tie a few sticks of cinnamon and cranberry sprig with a twin to give a rustic look to the table. 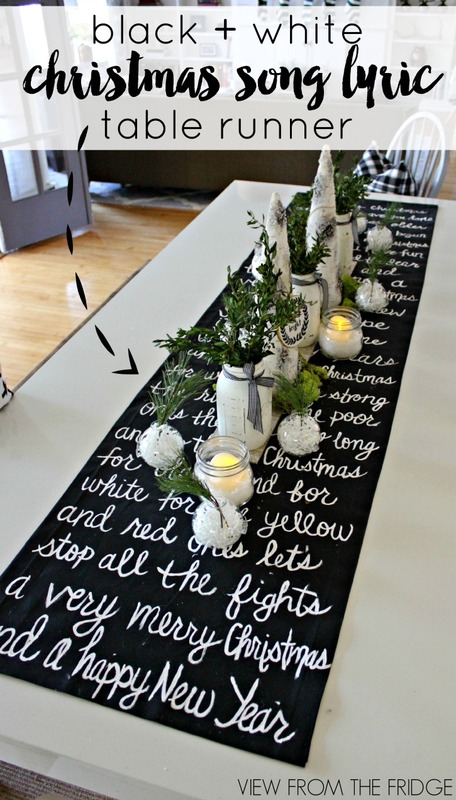 If you wish to use a light and no-nonsense table runner, keep the rest of the decoration elaborate. Use candles and gold cutlery to giving it a royal look. Who said you could use only candles for decoration? 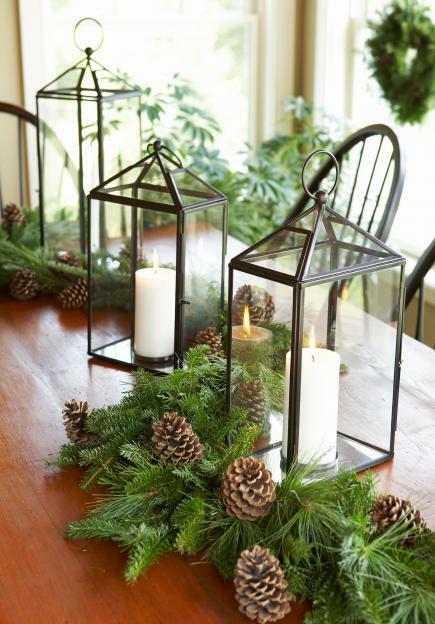 If you have a large sized table, you can use lanterns for table setting as well. It will look very elegant. 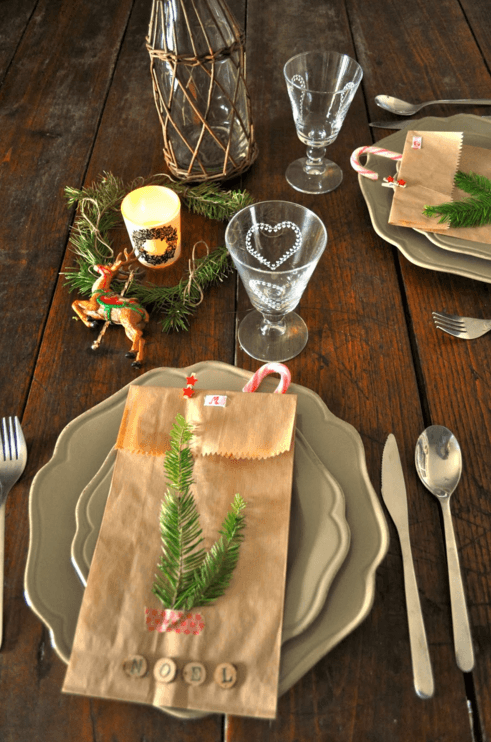 The paper bags that you discard unknowingly can be used for table decoration as well. 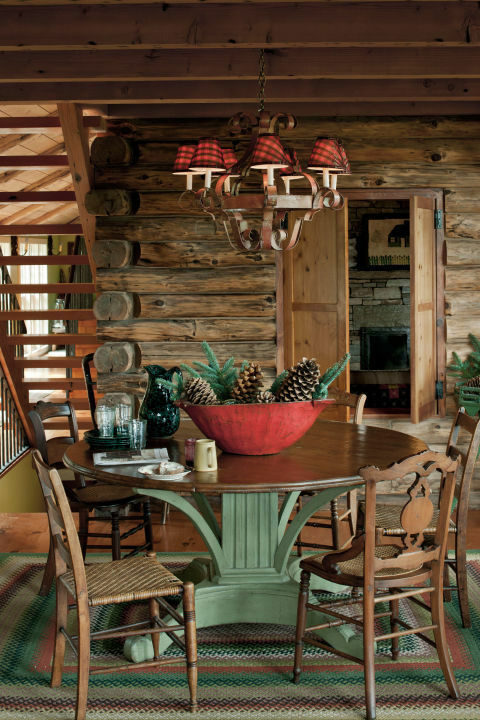 It would be a stunning inclusion for a rustic décor. 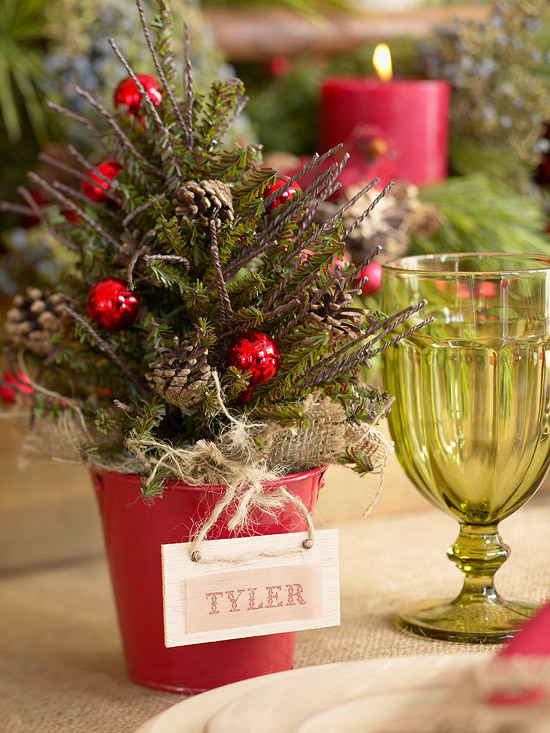 To give your table a seasonal look, tuck in a tiny, burlap wrapped the tree in a red bucket and place it in the middle of the table. Name tags can also be used. 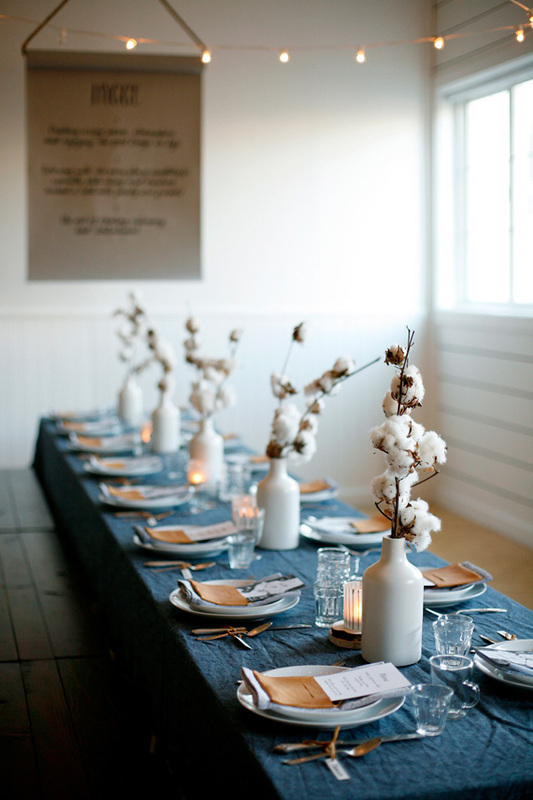 This has to be one of our favorite table decoration ideas of all time. The designing has been done so tastefully that it doesn’t look over the top even a wee bit. 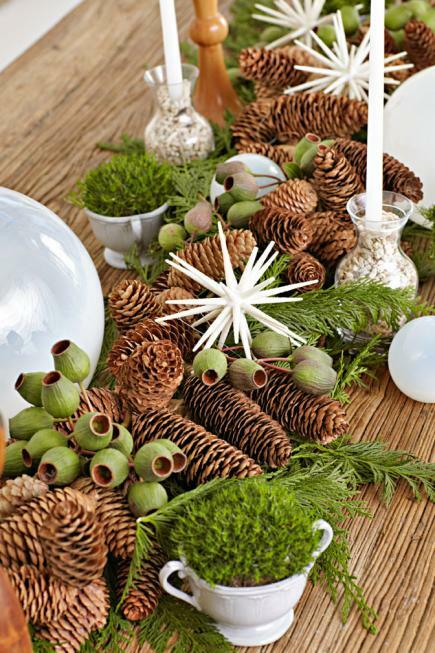 If you want something unfussy or wish to create a rustic table décor, you can use a bowl filed with evergreen sprigs and pinecones as the centerpiece. 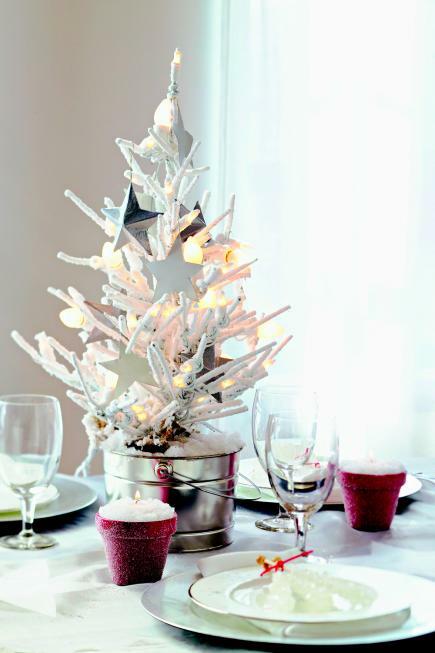 If you’re organizing a white Christmas, you can make a mini Christmas tree as the focal point of the dining table. White tree, especially, will make it look dreamy. 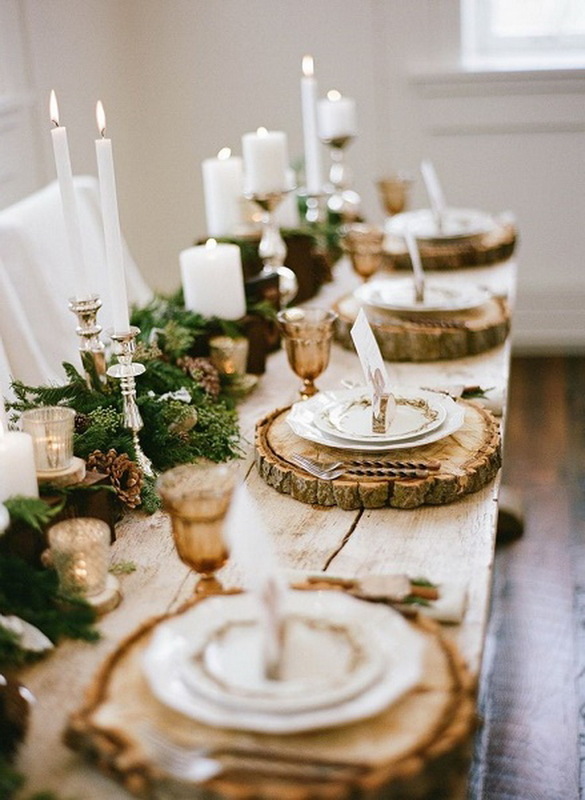 For a quick fix, place some tree candles, a gold vase and a spray painted deer on a white plate for the centerpiece. We even loved the merry messages writing on white plates. This is adorable. It features a chalkboard table runner with a list of things you’re thankful for. You can even replace it with a Christmas song lyrics or a poem. 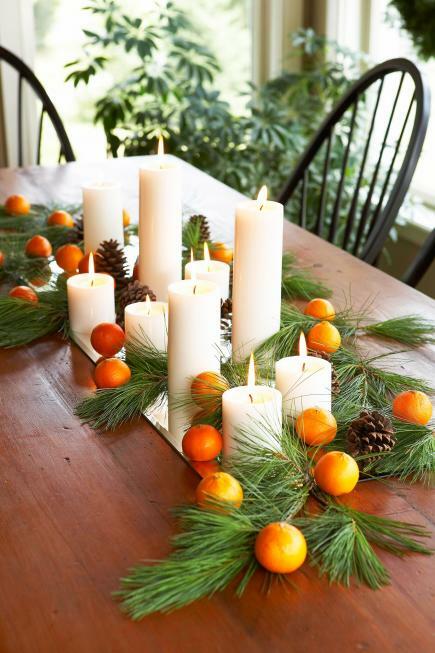 For a fresh and natural table arrangement, put white pillar candles at the center of the table, along with clementines, pinecones, and evergreen branches. Branch ornaments are the latest fad right now. 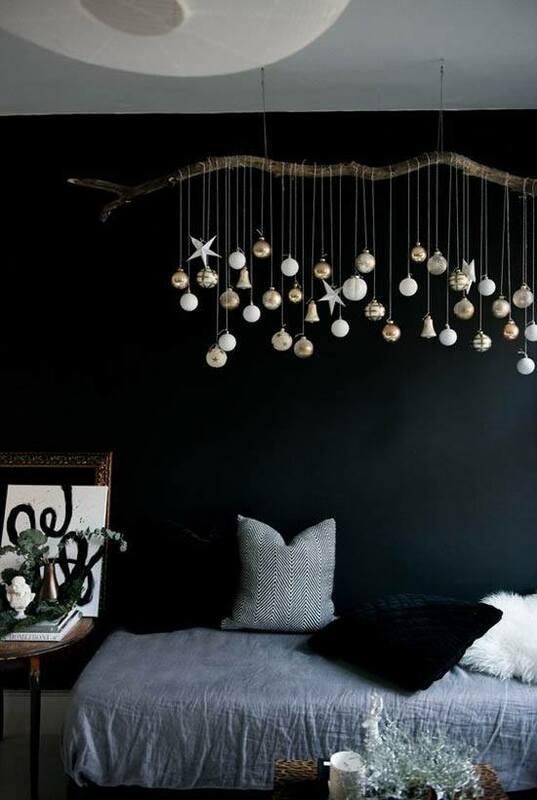 So you can use it as an alternative to the chandelier for the Christmas decoration. But stick to the color scheme.